Telomeres in most organisms are comprised of tandem simple sequence repeats (PUBMED:9671704). The total length of telomeric repeat sequence at each chromosome end is determined in a balance of sequence loss and sequence addition (PUBMED:9671704). One major influence on telomere length is the enzyme telomerase (PUBMED:9671704). It is a reverse transcriptase that adds these simple sequence repeats to chromosome ends by copying a template sequence within the RNA component of the enzyme (PUBMED:9671704). 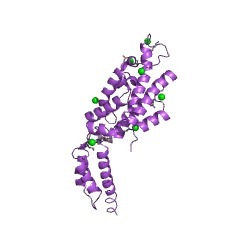 The RNA binding domain of telomerase - TRBD - is made up of twelve alpha helices and two short beta sheets (PUBMED:17997966). How telomerase and associated regulatory factors physically interact and function with each other to maintain appropriate telomere length is poorly understood. It is known however that TRBD is involved in formation of the holoenzyme (which performs the telomere extension) in addition to recognition and binding of RNA (PUBMED:17997966). Telomeres in most organisms are comprised of tandem simple sequence repeats [(PUBMED:9671704)]. The total length of telomeric repeat sequence at each chromosome end is determined in a balance of sequence loss and sequence addition [(PUBMED:9671704)]. One major influence on telomere length is the enzyme telomerase [(PUBMED:9671704)]. It is a reverse transcriptase that adds these simple sequence repeats to chromosome ends by copying a template sequence within the RNA component of the enzyme [(PUBMED:9671704)]. The RNA binding domain of telomerase - TRBD - is made up of twelve alpha helices and two short beta sheets [(PUBMED:17997966)]. How telomerase and associated regulatory factors physically interact and function with each other to maintain appropriate telomere length is poorly understood. It is known however that TRBD is involved in formation of the holoenzyme (which performs the telomere extension) in addition to recognition and binding of RNA [(PUBMED:17997966)]. There are 1299 Telomerase_RBD domains in 1298 proteins in SMART's nrdb database. Taxonomic distribution of proteins containing Telomerase_RBD domain. This tree includes only several representative species. The complete taxonomic breakdown of all proteins with Telomerase_RBD domain is also avaliable. Click on the protein counts, or double click on taxonomic names to display all proteins containing Telomerase_RBD domain in the selected taxonomic class. Structure of the RNA-binding domain of telomerase: implications for RNArecognition and binding. Telomerase, a ribonucleoprotein complex, replicates the linear ends ofeukaryotic chromosomes, thus taking care of the "end of replicationproblem." TERT contains an essential and universally conserved domain(TRBD) that makes extensive contacts with the RNA (TER) component of theholoenzyme, and this interaction is thought to facilitate TERT/TERassembly and repeat-addition processivity. 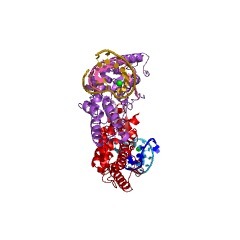 Here, we present ahigh-resolution structure of TRBD from Tetrahymena thermophila. The nearlyall-helical structure comprises a nucleic acid-binding fold suitable forTER binding. 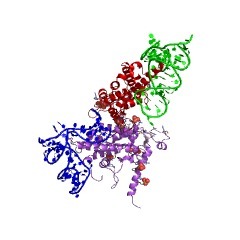 An extended pocket on the surface of the protein, formed bytwo conserved motifs (CP and T motifs) comprises TRBD's RNA-bindingpocket. The width and the chemical nature of this pocket suggest that itbinds both single- and double-stranded RNA, possibly stem I, and thetemplate boundary element (TBE). Moreover, the structure provides cluesinto the role of this domain in TERT/TER stabilization and telomeraserepeat-addition processivity. 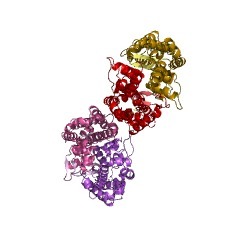 The reverse transcriptase component of the Tetrahymena telomeraseribonucleoprotein complex. Telomerase is a eukaryotic reverse transcriptase that adds simple sequencerepeats to chromosome ends by copying a template sequence within the RNAcomponent of the enzyme. We describe here the identification of aTetrahymena telomerase protein with reverse transcriptase motifs, p133.This subunit is associated with the previously identified Tetrahymenatelomerase RNA and the telomerase proteins p80 and p95 inimmunoprecipitation assays. Therefore, all four known Tetrahymenatelomerase components are present in a single complex. Expressed in rabbitreticulocyte lysate, recombinant p133 and telomerase RNA alone catalyze areverse transcriptase activity with some similarities to and somedifferences from native Tetrahymena telomerase. These experiments suggesta complexity of telomerase structure and function.